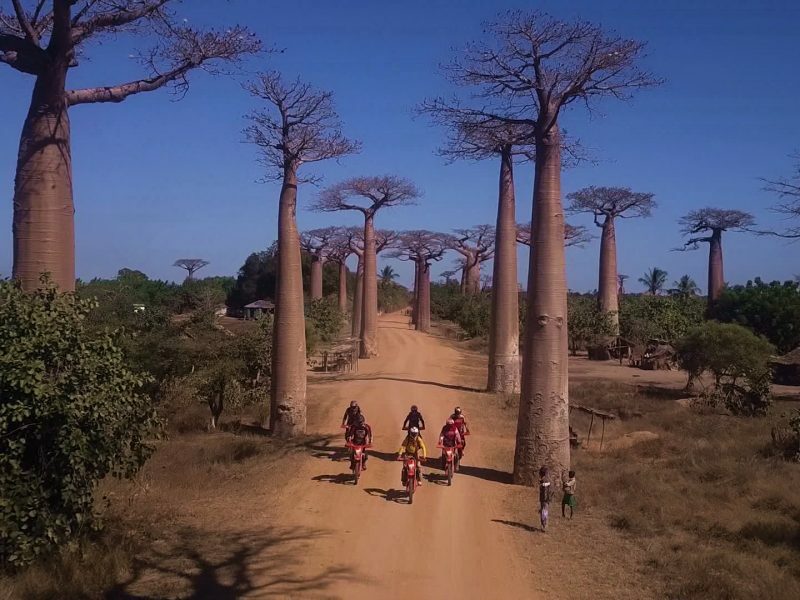 Here you are in a embraqués trail system accessible to all on the roads, tracks and rivers of Madagascar West. Between high coastal lands and landscapes, you will discover the charms of a boat down the river Tsiribihina, along with your motorcycle. The famous Tsingy and forests of baobabs await you at the end of the track, enjoying many visits and beautiful beaches of the Mozambique Channel. 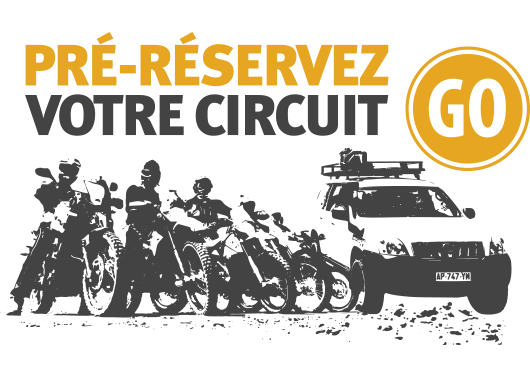 After an initial briefing by the team of company that will accompany you throughout your journey, you can perform a first grip your trail bikes specially equipped and prepared for your trip. Leaving the capital and its animated streets and congested, you take the national direct 7, surrounded by hills and rice paddies highlands. You arrive late morning in Antsirabe, tranquil spa, that you can visit in the afternoon. After a hearty breakfast, Antsirabe you leave to borrow a short dirt track that takes you to the lake Tritriva, volcanic crater with a thousand legends, you visit in the company of a guide. Back on the road, you cross the mountainous landscapes of the Highlands until Miandrivazo. Throughout the second day on the water, you discover the many species inhabiting the Tsiribihina : birds by the hundreds, lemurs, chameleons and same ... nile crocodile ! You stop this 2nd day in paradise : you learn to walk a waterfall before reaching a natural pool. After a final morning boat, where you can come across turtles, bats or crocodiles, you return the bikes to reach Belo Tsiribihina . The morning, start for a sandy track in early courses, then mixed (sand and laterite). The landscape alternates regularly between forest and large dry savannah zone. Crossing the Manambolo river on a ferry allows you to enjoy the scenery. The afternoon, visit the small Tsingy during 1 hour before heading to your hotel. 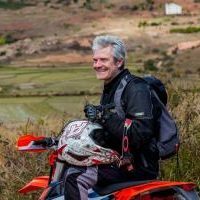 Day dedicated to the visit of the great Tsingy, which can be reached by motorcycle. Accompanied by an expert guide, browsing the Tsingy, ups 30 at 50 m. Picnic Lunch. The return to Morondava is smooth. 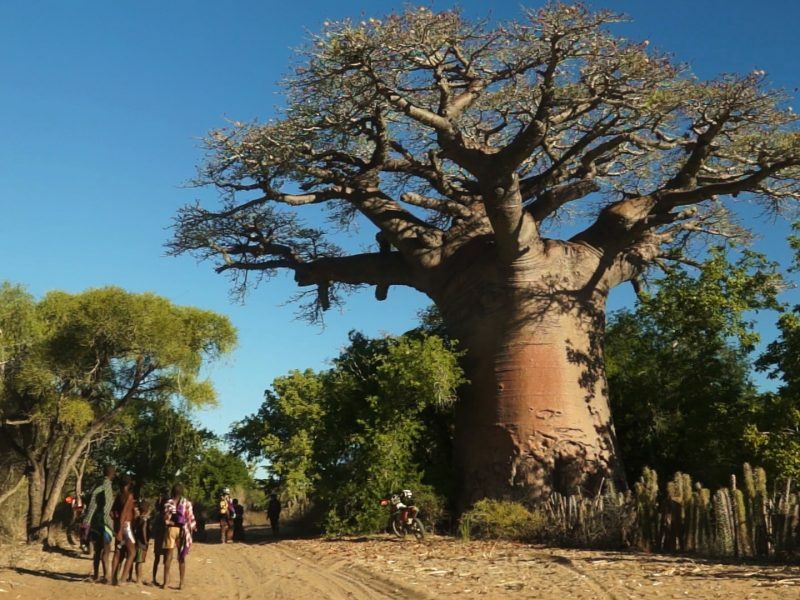 You arrive at the setting sun on the sands of the famous Baobab Alley. This step marks your bitumen gradual rise to the highlands. On the dry savannah landscape, you go to a succession of mountains dotted with numerous rice fields. Throughout the day, you taste the unique experience of driving on track. You cross splendid landscapes of rice fields dotted with numerous villages with typical architecture Highlands. The arrival on Ampefy allows you to discover Lake Itasy, volcanoes, geysers and waterfalls. This last step bitumen makes you take a beautiful road running between the majestic mountains of Imerina. The teeming streets and colorful Tana are waiting for possible last souvenir shopping.